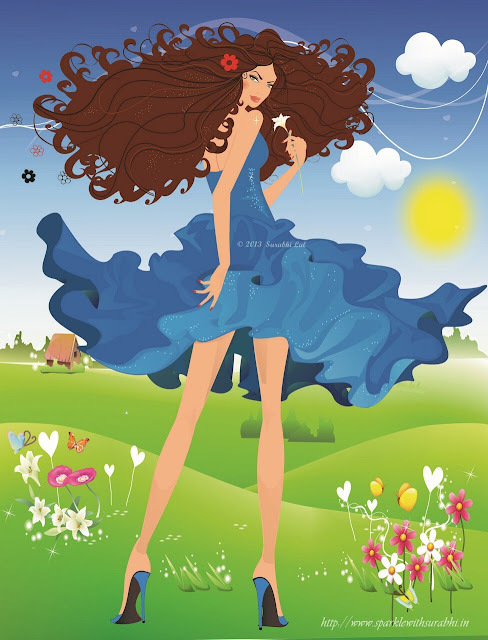 Indian Beauty Blog | Fashion | Lifestyle | Makeup | SparkleWithSurabhi : Awesome Vector Girls - Fashion!!! 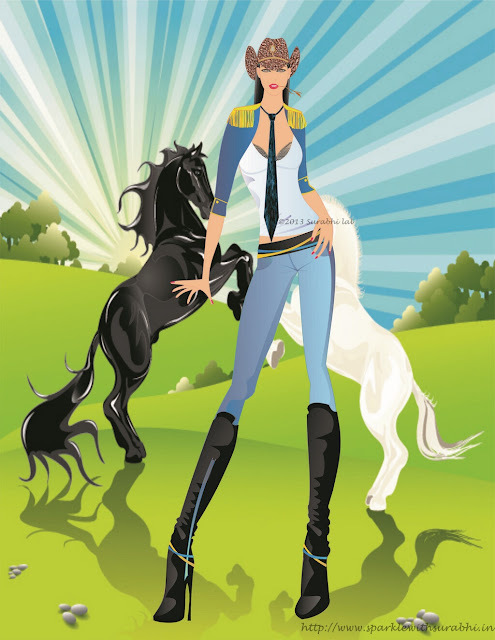 Awesome Vector Girls - Fashion!!! I was wondering what to post on my blog in 2013 and I thought what could be better than Vector Images? So, I back blogging with a Bang!, I have recently learned to create vector images on CoreldrawX5. It is a very easy software to create fashion images. If you are a fashion design student or planning to excel in this field it would be a good idea to learn designing on Coreldraw for making presentations. This software keeps on updating every year but vector images are created in the same way and the method does not change. Vector images are in demand if you are designer for web, graphic or fashion. 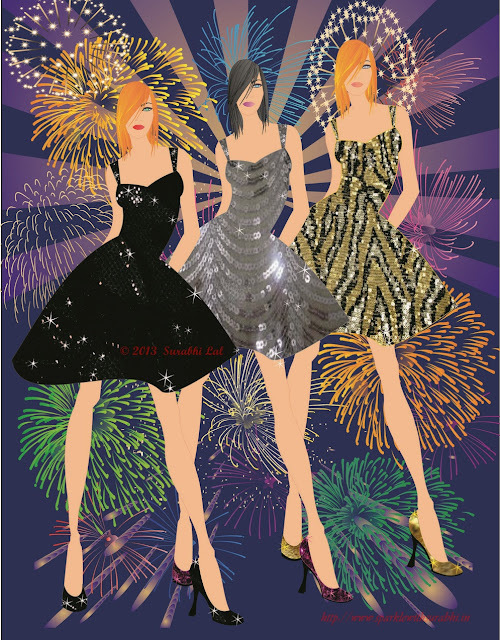 Here are some of the Vector Fashion girls that I have created. Confessions of a "SHOPAHOLIC" was one the first vector girls I created as you can see the girl is busy shopping in Paris. This would not only make a great presentation but also reflects a theme. She is nicely accessorised with Shoes, Bow tie,Waist belt and A clutch purse not only that she is shopping along with her dog and is posing for a picture nearby a cafe in Paris. Lady in the Mirror is probably one of the most difficult ones to create there are many transparencies in this vector fashion image which makes the file very heavy to work it but also turns out to be one the most glamorous vector girls!! She is in her bedroom which full of vintage elements and her paraphernalia lying on the dressing table. Fireworks: The main idea behind this vector was to create a group of party girls wearing sequined cocktail dresses enjoying themselves and watching the fireworks on New Year Eve!. They are also wearing matching or contrasting sequined shoes. Cowboy Girl - Howdy Pardner!! I am sure you all loved these vectors and I will keep sharing more vector girls that I create in future. Hi, good vectors. Necessarily need try a CoreldrawX5. 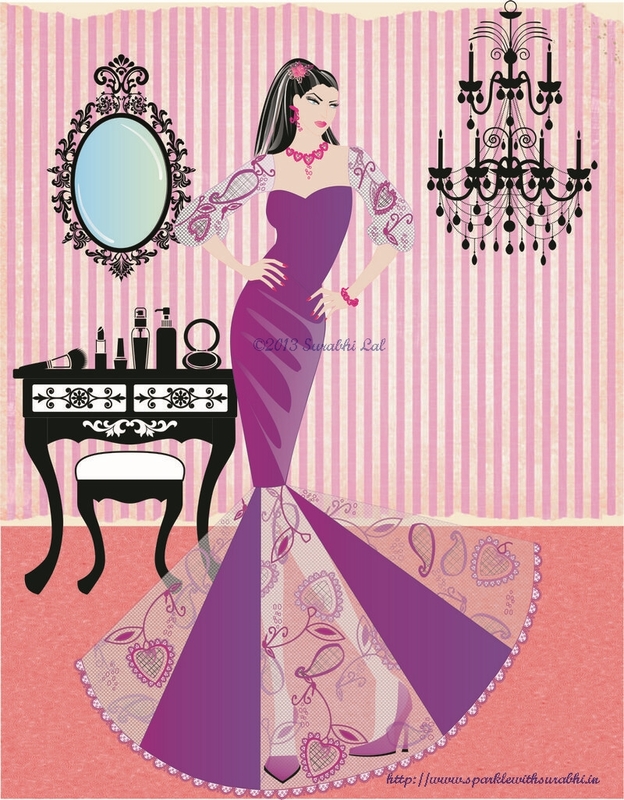 I'm up to this time commonly vectors downloaded here free vector graphics. I often watched fashion vectors. It seems to me that I had seen these vectors. I could be wrong.